All Things Jabu is constantly striving to give you more and with that in mind we have added another member to the team. This is the The Happy Hacker, a hack of a golfer, who receives no special treatmant from golf clubs, but will be sharing views here on the blog on all things golf in our newly title column, “Stroke of Luck”. His first assignment, joining our friends from Puma for the PUMA Cobra Open. 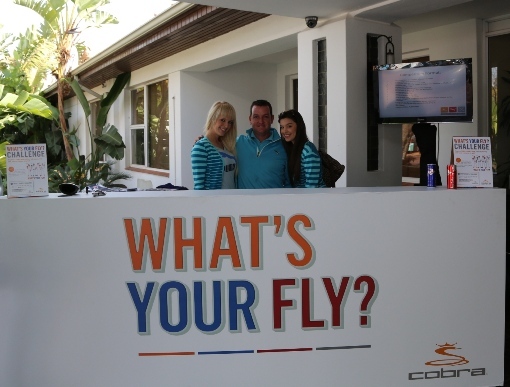 On Friday 17 May 2013, this lucky blogger had the opportunity to take to the golf course for the PUMA Cobra Open 2013. I am at best a hack when it comes to golf (and that is being kind), so to have the chance to take part in the field for the 2013 PUMA Cobra Open was a fantastic opportunity to test my skills against much better and more skilful golfers and in the process, possibly enhance my own game. PUMA has not hosted this event since 2008, so when we heard about it there was a lot of excitement around the All Things Jabu offices. 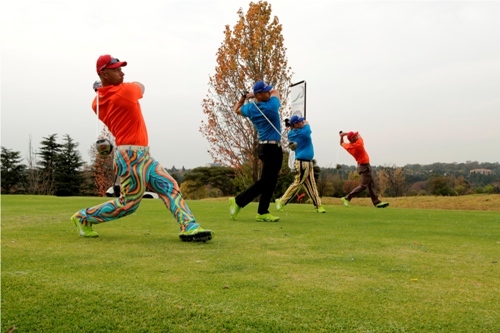 The event was to be hosted at the Johannesburg Country Club – Woodmead course; one of the best courses in the country even on a bad day. I was briefed that this would be a golf day with a difference; judgement would be reserved for after the day. The weather on the morning of the PUMA COBRA Open played its part and looked fantastic, perfect for a Friday on the course (which beats a Friday in the office – even in the rain/hail/snow). When this more than willing participant showed up I was greeted by the welcoming committee who were handing out our welcome packs. Once you proceed through the club house, you are then greeted by the scenic view of the course and the northern suburbs of Johannesburg. The course was in absolutely pristine condition, while every aspect of this course oozes class. As I proceeded down to the practice greens I was blown away by rows of carts lined up and ready for all the competitors – with the bags already stacked onto the carts. The format for the day was fourball alliance with the two best scores on each hole to count (which relieved this blogger very much – see earlier statement regarding my golf skills). There would also be a few surprises set up for us on certain of the holes. I was paired up with the guys from Compleat Golfer, who were also sponsors of the event, another lucky break for this blogger because guys from Compleat Golfer were definitely going to be good at golf right (Just for the record they were very good at golf). Once all the introductions were made we made our way off to the tee box at the first hole. We were greeted at the first hole by Golf Guys for a swing analysis, on our first hole, before we had even warmed up. We were informed that the video for our swing analysis would be available online, on a secret website that this blogger will never be releasing to the public, ever! It is not that my swing was bad, it is just that I really don’t have time for all the coaching requests that I will receive. A few holes in we reached a fairly long par five and we were greeted by a lovely lady who explained the rules of this hole to us, the aim was to play the hole as fast as possible, the time would start when the first ball was hit and end when the last ball was sunk, the quickest team to finish the hole won a prize <Insert a manly gulp here>. I am not sure how long it actually took us to play the hole but the winning time was 3min 52 seconds (I don’t think we were too close to that). The highlight of that hole was one of my playing partners almost taking out, but not in the good way, the lovely lady checking that we all sunk our balls. On the 9th tee box we were greeted with another interesting surprise the rather large men from the Quantum Long drive were there to give us the best drive they could. If you don’t know about Quantum Long Drive you need to check out some of the previous posts and videos put together by Jabu here on All Things Jabu (Check out “A Morning with Quantum”). These guys are absolute machines using regulation drivers (with the longest possible shaft). They throw everything they have behind the ball and the result is a drive to beat all other drives. Basically from the tee box we played amercian scrambles from the best drive, it just so happens that the best drive was less than 100m from the centre of the green! I make no further comment about that hole. The 10th hole at JCC – Woodmead is an amazing driving hole, wide open fairway not much in terms of hazard that come into play and to this bloggers relief no big trees in the way. I managed to oblige such a lovely driving hole with a monster of a drive, at which point I should have packed up my clubs and gone home, as golf is a humbling game. During our round we were greeted again by some lovely ladies (don’t ask me why they use gorgeous girls to deliver this kind of news to you) who explained the rules of the hole we were about to take on. Each member of the fourball would draw a card and that card would represent the club that you needed to use for the entire hole. This luck blogger drew a 7 which meant I needed to play the entire hole with a 7 iron. I just kept thinking to myself this is just not good we are going to be here all day, a seven iron on a long par four, I would need to summon my inner Angel Cabrera. My brother in arms had to use clubs like an 8 and 6 iron as well, with only one of our bank of brothers lucky enough to draw a Joker which meant he could choose any club he wanted to! He chose a long 4 iron, which when he got closer to the hole he realised might have been a mistake. 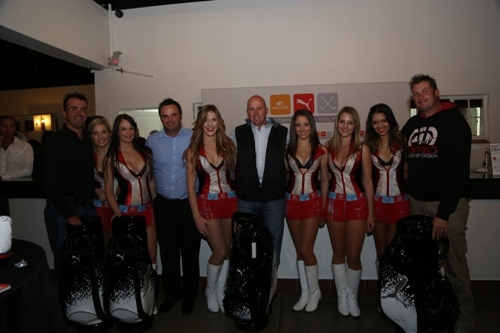 But PUMA were not done with us yet, a few holes later we were greeted with the longest straightest drive competition. Once again the chaps from Golf Guys greeted us with all their fancy equipment to see who hit the longest and straightest drive.. You will never guess who won the straightest drive; IT WAS ME! Yes, ladies and gentleman, this luck blogger managed to only have a 0.1 meter deviation on his drive straightest drive for the day! From there we played into the 18th on this picturesque course and tallied our scores. Our team made a respectable 79 although it would turn out this was not enough for the win. Party like only PUMA know how! After showers and getting changed we progressed to the even more social element of the day, first of all we were invited by Castle Lite to join them on the verandah of the club house for a few cold ones before the prize giving and dinner. In the hall, we were greeted by a party only PUMA knows how to throw and they really know how to throw good parties (I have been to the PUMA social club more than once). The hall was decked out with branding, couches were set out around the entire hall and tables were stocked with buckets of Castle Lite. 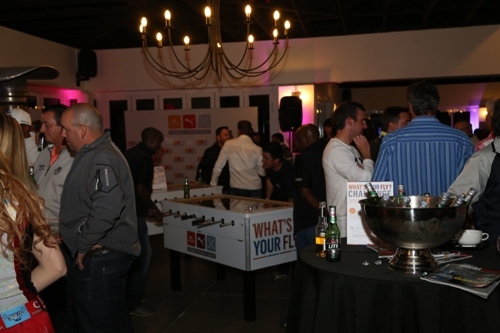 As we entered a beer pong table was set up and some of the Blue Bulls Cheerleaders were waiting for any man brave enough to challenge them, fooseball tables were also set up to really help add to the social atmosphere. The Blue Bulls Cheerleaders were handing out shooters too, now it is hard enough to say no to a good party on a normal day, but when these ladies are offering you a shot you really can’t say no, it just wouldn’t be polite. As is a consistent at PUMA Social events, the impressive organising of Roadtrip meant that there would be no drinking and driving. Of course the party continued, but at this point those stories are best left for another day or maybe even another blog. I would just like to extend a huge thank you to my team for the day, the gents from Compleat Golfer and especially the guys and girls from PUMA who arranged a fantastic day out and really did give us a golf day with a difference. They never fail to deliver at a quality level and I really do hope that they decide to make this an annual event.